A common complaint we see when dealing with patients who exercise regularly or who have just started getting back into exercise is that they are experiencing pain underneath the ball of their foot. To be more precise, the pain is coming from the joint just before the big toe. The ball of the foot has a number of structures that can get damaged due to high load. Of these are the sesamoid bones. 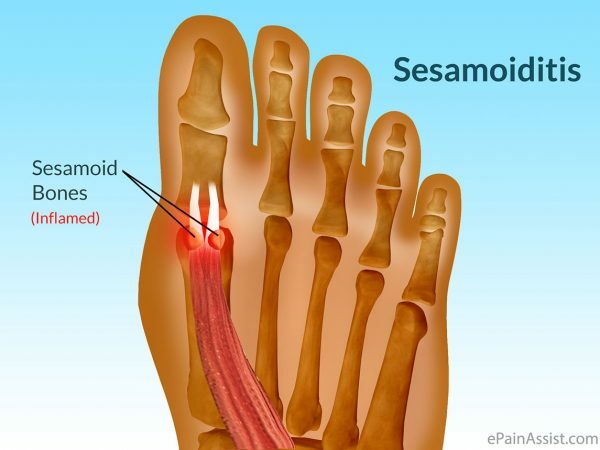 The sesamoids are 2 pea-shaped bones which sit within a tendon beneath the big toe joint. Every time you put pressure on your forefoot to move forward, the sesamoid bones are subject to that pressure and load. And like any bone, the sesamoids can fracture or the tendons surrounding the sesamoids can get aggravated and inflamed. When this occurs, it is called sesamoiditis. Foot posture and underfoot pressure distribution may also be factors causing sesamoiditis and can compound symptoms caused by exercise. that the pain is made worse with activity. Depending on severity, these symptoms may eventually resolve with rest. However, when patients return to activity there is a high rate of reoccurrence. Left untreated, sesamoiditis can progress to stress fractures, leading to long layoffs from sport or activity. At The Foot Group, our qualified podiatrists can help. Using our state of the art Zebris Gait analysis machine, we can measure the precise pressure peaks and distribution underneath the feet when walking and running. We also monitor the function and efficiency of the biomechanics of the foot to enable us to provide a deeper understanding of why this pain is occurring and how to appropriately treat it. Spencer studied a Bachelor of Podiatry at the University of Newcastle. As a Rugby player he has always had a particular interest in sports biomechanics and the pathomechanics leading to injuries such as heel pain, forefoot deformities, ingrown toenails, arch pain, ankle pathologies, shin splints and knee pain. Spencer has worked in both the private and public sector as a podiatrist and brings with him a wealth of knowledge concerning the diabetic foot, adult and paediatric orthotic therapy and the diagnoses and management of musculoskeletal injury. Having spent two years working at The Athletes Foot as a Fit Technician, Spencer understands the technicalities of footwear and it importance in ensuring correct foot function. Spencer joined our team at the Lane Cove clinic in 2016.